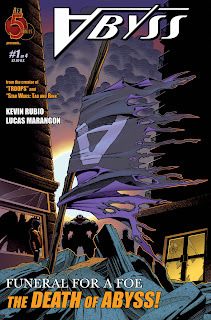 I, for one, am interested in the various titles coming out from new comic publisher Red 5 Comics. (Even though it took me WAY too long to get where their name came from!) The concepts of the books strike me as interesting, and the previews I've seen thus far have all been very promising. But I wanted to take a moment to highlight probably one of the more obscure aspects of their books so far that I'm sure will be generally under-appreciated: the logos. The Red 5 logo itself is interesting. It was designed by Steve Anderson, who had already spent many years doing Star Wars art. But instead of trying to play up that angle here, he's gone an entirely different route. I'm sure some of that has to do with the fact that, legally, they couldn't really appropriate any Star Wars imagry, but the end solution is a creative one. 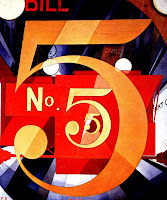 It draws heavily on Charles Demuth's famous 1928 painting, I Saw The Figure 5 In Gold. Anderson has reversed the coloring, played down the angular elements, and altered the font but it's origins, to me, are unmistakable. The logo also holds together very well, despite having the background of the original painting removed. Despite the name itself deriving from the Star Wars mythos, and most of the players having a history of working in George Lucas' playground, this logo invents connections to other great works and lifts the company image beyond the notion that these guys are just Timothy Zahn wannabes. Another logo that stands out for me is the one for Abyss, also designed by Anderson. It's interesting in that also has it's origins in early 1900s art, but in this case, it draws upon Action Comics for inspiration. As you might note, the Abyss font is essentially the same one used for Action Comics and the only real distinction here is that the capital "A" is turned upside down. I find this fascinating first because that alteration proves to be almost no hindrance to its legibility. There's no question that the comic is called "Abyss" and not "Vybss" or "Ubyss." I'm mildly curious (but not quite enough to actually experiment with this myself) to see if that legibility would remain using an unfamiliar font, or if the Action Comics reference is what actually compells the viewer to read it properly. Similarly, would it read as easily to someone wholly unfamiliar with the source logo? I'm not certain if Anderson designed the logos for Red 5's other comics, but they certainly seem up to his level of expertise. And while the logos by themselves aren't really enough, in my mind, to warrant buying any given comic, that attention to detail suggests promise of the same when it comes to the writing and interior art. Despite the fact that Blair Butler (who needs to be the subject of a future blog entry here) expressed unmitigated delight with the company and their books, I think they're still most definitely worth looking at. This Be Makin' No Sense! How Many Comic Book Fans Are There? "Circle The Wagons! The Fanboys Are Coming!" Where Have My Pirates Gone? Up, Up, And Oy Vey!